The 12 perennial vines for sun featured here offer variety in abundance. Eight are flowering vines grown more for their blooms than for their leaves, three are foliage plants, and one is grown for its berries. Two are early-spring standouts, and one enters its prime time during the fall season. While most are cold-hardy to at least zone 5, two are classics for regions with hot weather and will have to be treated as annuals by Northern gardeners. 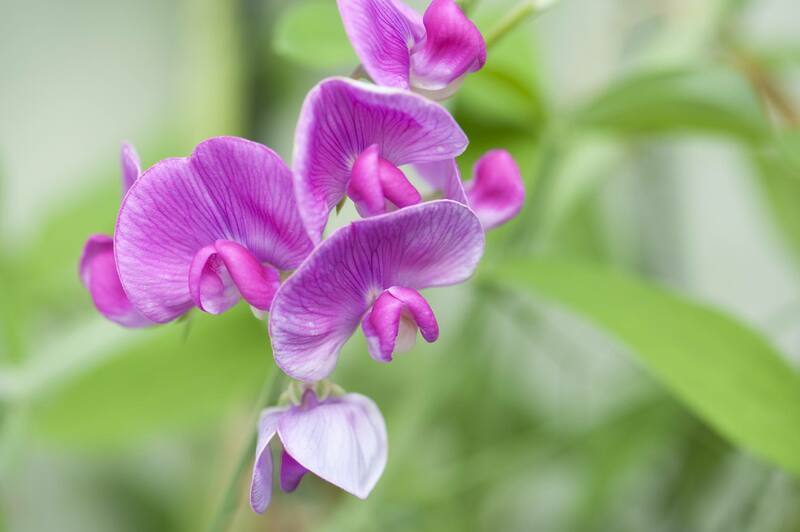 The sweet pea that is a perennial vine for growing in the sun is Lathyrus latifolius (as opposed to ​L. odoratus, which is an annual). Even if it didn't have "pea" in its common name, one look at the flowers would convince plant geeks of its membership in the pea family. Its heritage notwithstanding, this vine is grown as an ornamental and not for food. What is great about arctic kiwi vines (Actinidia kolomikta or Arctic Beauty) is that they give you another foliage season to look forward. We all know about leaf peeping in the autumn, and no other time of year will match fall in this regard. But on a small scale, this ornamental kiwi grants you a spring foliage season. Although it can take some shade, the color will be better when it receives healthy doses of sunlight. Most people associate these perennial vines for the sun with California, the Caribbean, and the Mediterranean. They are old-time favorites in sunny courtyards. In the North, you have to treat them as annuals. In addition to offering beautiful flowers, some types of Bougainvillea have ​variegated leaves. The widely-grown genus, Clematis, contains some of the most commonly grown plants in North American landscaping. The Jackman type (C. jackmanii) may be the most popular of all. While it can stand a little more shade than some other kinds, gardeners will generally be most successful growing it as a vine for sun. As popular as Jackman's clematis is, not everyone is looking for a dark-colored flower. Dr. Ruppel gives you an alternative in color: pink. Grow it on an arbor and use it for a vertical element in a pink-themed garden. A third clematis choice is The President. Notice the progression in the number of sepals: from four (on Jackman) to 6 (on Dr. Ruppel) to 8 (on The President). In fact, with twice the sepals as are found on a Jackman's flower, the bloom on The President looks like it should belong on an entirely different kind of plant. You may think "beer" when you hear "hops," but Humulus Summer Shandy is grown for its golden leaves. While it also produces so-called "strobiles" for added interest, it is valued primarily as a foliage plant. The problem with this plant is that it is high-maintenance: It pops up all over using its vigorous rhizomes, meaning you will be constantly pulling it out (unless you actually want it to spread). There are a number of kinds of jasmine, some of which are fragrant and suited for growing only in warm climates. Neither is true of winter jasmine (Jasminum nudiflorum). Northern gardeners value it mainly for the fact that it is one of the earliest bloomers, sometimes beating the Spring Equinox to the punch. This plant is shrubby by nature, but it can be trained so as to grow as a vine. Confederate jasmine is not truly jasmine (a fact revealed by its botanical name: Trachelospermum jasminoides). True jasmines, such as winter jasmine, belong to the genus, Jasminum. But like some of the better-known true jasmines (and unlike winter jasmine), it has fragrant flowers and is not very cold-hardy (only to Zone 7). If you had never seen Dutchman's pipe vine (Aristolochia macrophylla) and knew only that it gets its name from its uniquely-shaped flower, you might attach more significance to the bloom than is really there. The curious flower may serve nicely as a conversation piece, but the traditional use for this plant is as a living privacy screen for porches (to which it brings welcome shade in the summertime as well). So like arctic kiwi and hops, it falls into the foliage plant class. The flowers are too small to be very noticeable. If you live in North America, it is best to grow Wisteria frutescens, not only because the other two are invasive, but also because it may very well bloom sooner for you. Just as American wisteria needs to be distinguished from other varieties, you must distinguish between American bittersweet (Celastrus scandens) and the invasive kind, the Oriental bittersweet (Celastrus orbiculatus). The latter is omnipresent along the roadsides of places like New England. Just hope that it does not invade your yard because removing Oriental bittersweet entirely is quite a challenge. Oriental bittersweet may be free, but you will be much happier, in the long run, buying American bittersweet from a (reputable) garden center. Bittersweet is grown for the highly ornamental berries the vines bear in fall. It is commonly used in fall crafts (in wreaths and such). Another vine useful for fall crafts is the type that bears the hardshell gourds for decorating. Perhaps you would like to grow these perennial vines for sun, but you feel that you just don't have a sunny enough spot in which to grow them. If so, be aware that there are perennial vines for shade, too (albeit fewer choices).